Spituk trek is one of the easier treks and therefore best for the beginners. The place is famous for its Gompas. 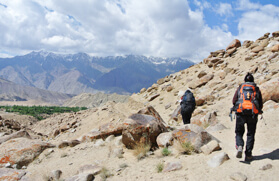 This trek will offer you an opportunity to explore a few old Buddhist monasteries, villages and rich Ladakhi culture. Spituk Monastery is the most well-known monastery of this trek. Easily accessible from Leh, Spituk trek offers a variety of landscape with rewarding peaks like Kang Yatse (6400 mts), Stok Kangri (6115m) and the Zanskar Range from the south west. While trekking to Spituk, you can see Karakorum and Nun Kun Range (above 7000m) from a high pass top. At Trekking in India, we offer impressive Spituk trekking tours of five/six days, which is great for those who do not have much time to plan long holidays. 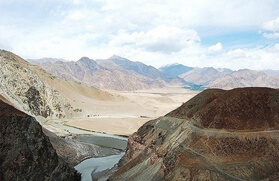 Located in Jammu and Kashmir, Spituk trek is the only trek around Leh, which is easily accessible without taking much time. A trip to Spituk includes lots of fun, excitement and adventure. You will surely get an amazing trekking experience on this route. This trek is famous among the tourist because of a pleasant weather and an awesome ambience. If you love trekking, then this place is a heaven for you with some challenging trekking paths. You can meet the locals and find out their simple living and varied culture and tradition. The major attraction of Spituk trek is the camping at the base of Kangyatse massif peak (6400m) controlling the breathtaking fields of Nimaling. Explore more with us and witness paradise on this earth from your eyes. Full day sight seeing at Leh covering Hemis, Shey and Thiksey Monastery. In the morning after breakfast drive to Spituk (8 kms). From here the trek traditionally starts at the bridge over the Indus about a kilometer west of Spituk Village. However, a jeepable road slated to connect Spituk runs nearly all the way to Zingchan. Upon arrival at Zingchan set out a campsite for dinner and overnight stay. Evening explore the area. In the morning after breakfast you will ascend the 4,900-m. Stok Pass also known as the Namlung La. If you are fit and have camped at the plateau just under the pass as all do, you should have no problem climbing up to the pass. One can climb steadily and made it in less than 1.5 hrs.From the campsite walk up east for 10 mins and on your right you will find a path zigzagging up the mountain.At first it looks quite steep. Don't worry.soon crosses over the cleft to the left and heads up east at a lesstroubling gradient all the way to the pass. Dinner and overnight stay in tent. Today is an easy day going downhill all the way. Follow the stream on its left bank as it heads north. The path is broad and easy. You will find willows and wild roses growing on islands in the middle of the stream which grows quite wide as you approach Stok. Visit the Stok Palace, residence of the king of Ladakh after he was.